The grand sales are very much like the final exams for the three large Indian e-tailers — firms compete head-on on overlapping dates, and vie to grab as many eyeballs and sales as possible. The industry tracks results closely too — Flipkart’s strong performance in the sales last October had given the company a shot in the arm, and signaled that it was capable of taking on Amazon juggernaut. Flipkart had raised $1.4 billion in a funding round that followed the sale; Snapdeal, which had decisively finished third, ended up firing 600 people. While Flipkart had been the top performing e-tailer last October, things have changed a little since then. If Google Trends data is to be believed, Amazon is narrowly beating Flipkart in this year’s sales, and now occupies the top position. Amazon and Flipkart didn’t have overlapping sales this year. Amazon’s Great Indian Sale was from 11th to 14th May. Flipkart’s Big 10 sale started on the 14th May and will go on till 18th. Snapdeal, which is also negotiating a sale to Flipkart, started its two-day Grand Unbox Sale on 11th May, but after a muted response, launched another sale from 14th to 16h May. Google Trends Data has closely mirrored sales performances in the past. Last year, we’d used it to show how Amazon was gaining ground on Flipkart. We’d also used it during the October Diwali Sales to show that Flipkart was beating Amazon, a fact which was corroborated when the official figures were released when the sale was over. This year, the data’s saying something else. Amazon has been the most searched etailer for a while now, and immediately saw a spike in searches when its sale was announced. When the sale started on 11th May, Amazon’s search traffic was as much as four times that of Flipkart’s. Amazon maintained this lead until 14th May when its sale ended, with its search traffic being nearly twice of Flipkart at that point. Flipkart started off strong, jumping into the lead when its sale started on 14th May. But it never really opened up as much of a gap as Amazon had; at its peak, Flipkart’s searches were only 1.5 times those of Amazon. Two days into the sale, Flipkart’s traffic has dropped almost the same as Amazon’s. All this while, Snapdeal, which is a clear third, has barely registered a blip in its traffic. This suggests that for the first time ever, Amazon might’ve narrowly edged out Flipkart in a head-to-head sale. This might be partly because Amazon appears to have marketed its sale more aggressively than Flipkart. Amazon had a long TV campaign during the IPL with its own team called Chonkpur Cheetahs, while Flipkart hadn’t been as visible on TV, confining most of its promotions to digital. But it could also be part of a broader trend — since its launch in 2014, Amazon has been steadily creeping up on the top two etailers. In 2015, Flipkart was the most-searched etailer across nearly all Indian states. Snapdeal was leading in a handful of small states, including Himachal Pradesh, Jammu and Kashmir and Sikkim. Amazon, which had started operations only a year ago, wasn’t the most searched portal anywhere. In 2016, Amazon made its big move, becoming the most-searched portal across large swathes of West and Central India. It was a neck-and neck battle then, with Amazon being stronger in the west and Flipkart stronger in the east. Snapdeal had ceded ground to both these companies. But in 2017, Amazon has surged. It’s now the top-searched retailer across nearly all of India. 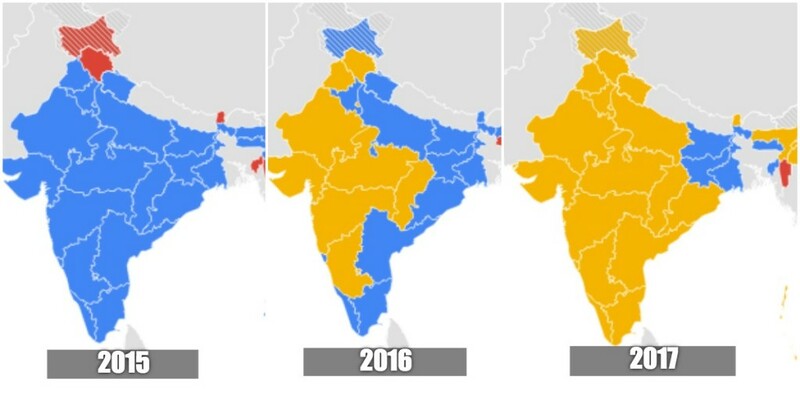 Flipkart’s been pushed into Bihar, Jharkhand and Bengal, apart from a couple of North East states. Amazon’s dominance is nearly absolute — the map in 2017 is a compete reversal from the map in 2015. This data only serves to show why companies across the board are ganging up against Amazon. Flipkart and Snapdeal will likely announce their merger soon, which means that the two biggest Indian companies will join forces against their rival. Microsoft, eBay and Tencent have also backed Flipkart, hoping their combined firepower will be able to take on the Amazon juggernaut. But it doesn’t appear to have worked this far – Amazon’s likely won the sales this year. And even the general trend says that as far as Indian e-tail is considered, Amazon is now very much top dog.